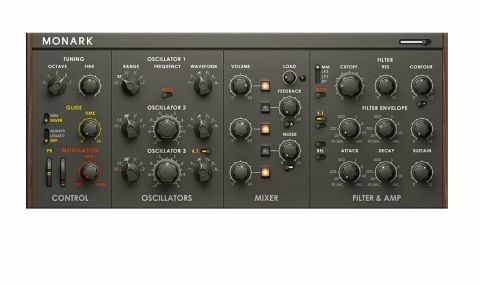 Arguably the best Minimoog Model D emulation yet, Monark sounds amazing but its Reaktor requirement is irritating. Amazingly realistic retro sound. Comprehensive preset bank. Meticulous attention to detail. Self-oscillating filter. Zero-delay feedback technology. No external audio input. Reaktor or Reaktor Player required. When we saw the cryptic teaser video for Native Instruments' new Monark synth, boldly proclaiming it to be "one synth to rule them all", we were left scratching our heads. It sounded like a virtual analogue synth to us and, while potentially interesting, such instruments are rarely revolutionary. We were quite astonished, then, when the instrument in question turned out to be yet another emulation of the legendary but ubiquitous Minimoog. Our astonishment was followed by mild disappointment, as it became apparent that Monark isn't actually an instrument in and of itself but, like Skanner, Razor and others before it, opens in Reaktor or the free Reaktor Player (VST/AU/RTAS/AAX/standalone, downloaded from NI's website). Though these 'shells' work perfectly well, it still means an added layer between DAW and instrument. More than that, it leaves us thinking about all those freely available Minimoog-alikes in the Reaktor user library - does Monark really surpass them? Of course, such a framework would be ideal for Reaktor power-users who want to tweak the ensemble from the inside out, but NI have 'locked' the most interesting bit - the filter - which rather limits such endeavours. "Monark - like u-he's DIVA - sports a thoroughly modern approximation of the Moog's famous filter using ZDF technology"
You may recall a Reaktor-style application called SynC Modular. It was developed by Dr SynC, aka Vadim Zavalishin, who was snapped up by NI in 2003. He is known for his papers describing the the now-hot 'zero-delay feedback filter' DSP technique, and Monark - like u-he's DIVA - sports a thoroughly modern approximation of the Moog's famous filter using ZDF technology. But we're getting ahead of ourselves. For those who don't know, the original Minimoog was a three-oscillator analogue synthesiser with the third oscillator doubling as an LFO (though all of them could be switched into Lo mode for this purpose). The oscillators, along with a noise generator and external signal input, were routed through a mixer, then into a 24dB resonant low- pass filter. Two envelope generators offered attack, decay and release stages. One was hardwired to the amplifier, the other to the filter cutoff. The Mini was monophonic, but glide could be used to sweep between the pitches of notes for a distinctive legato sound, and the filter could be overdriven in the loveliest way by routing the headphone output back through the external input, causing a feedback loop. Simple and direct, it's virtually impossible to make a bad sound with a Minimoog. And so to Monark. The design is true to the Minimoog save a few small differences, many of them behind the scenes. The Mini's selection of six waveforms are emulated (with Osc 3 getting a reverse saw that mirrors that of the other oscillators), and so are all six pitch ranges. Interestingly, the waveforms have been tweaked so that a sawtooth on one oscillator will have subtly different harmonic content to that of another, and the same goes for all the waveforms. Each oscillator's key-tracking varies a little, too, just as it does on a real Moog. That's serious attention to detail! The Mixer section of the Mini is recreated 1:1, with white/pink noise, overdrive via the Load control, and a Feedback knob for mimicking the aforementioned effect created by routing the output back into the filter - this can summon up some serious grit and filth when pushed. "To say that the filter sounds authentic would be an understatement - it's absolutely stunning"
The filter section is the highlight of the instrument. Of course, the Mini's 24dB low-pass model is here and spotlighted, but you can also choose from two more low-pass filters (6 and 12dB) or a 12dB band-pass, each of which sounds significantly different to the Minimoog filter. Importantly, the filter can be made to self-oscillate - an all-too-rare feature among soft synths. As with the original, you can apply two levels of key modulation and also connect the filter to the OSC3/Noise mod mix. To say that the filter sounds authentic would be an understatement - it's absolutely stunning; it's clear that we're hearing the benefits of Dr SynC's ZDF expertise. There are other optional deviations from the Minimoog architecture, too. In addition to the added filter modes, you can choose from two Glide modes (MM, acting like the original, and Silver, with which the glide time is constant, irrespective of note range) and two Legato modes, while a Settings view enables editing of pitch and mod wheel response curves, oscillator leakage and drift, key-tracking and more. Plus, of course, you get all of the benefits of either Reaktor or Reaktor Player, depending on which you're using with Monark. Snapshots, MIDI assignments, OSC control and more are available; however, we'd still prefer it if Monark was a self-contained, non-Reaktor plugin. Monark doesn't represent anything new at all for most potential users, but any grumbling about its presentation and subject matter has to be offset by the fact that it sounds superb. The included patches do an excellent job of providing some inspiration, but it's so easy to roll your own that you may never get around to using them. While Monark may not be enough to entice Komplete owners to upgrade on its own merits, it does sweeten the pot. Reaktor owners will have to weigh its authenticity against a user library full of vintage emulations. Compared to VA synth plugins such as those from u-he, Arturia, et al, Monark is in line with other modern vintage clones and sounds as good as - if not better - than, any of them.